More than half of the world’s population now lives in urban towns and cities. By 2030 this number will swell to about 5 billion. That’s according to the United Nations Population Fund, which also identified that young people from age 10-24 constitute a quarter of the world’s population. The confluence of children and youth living in urban environments cannot be minimized, especially when we consider how children today have a decreased exposure to the natural world. Richard Louv terms this a “nature-deficit disorder.” He has concluded that direct exposure to nature is essential for healthy childhood development and for the physical and emotional health of children and adults. For urban kids to develop the habitus of connecting to the natural world, education is often the key. Many environmental literacy programs exist across the globe. Some report excellent results. Others, however, are inconclusive. What’s going on here? A group of legislators and environmental experts met in Annapolis, MD in April, 2016 to advance environmental literacy programs and policies throughout the Chesapeake Bay Watershed. As more people move into the Chesapeake Bay watershed, previously undeveloped land is cleared for roads, homes, and businesses. As the area is slowly urbanized, forests, farms, and other valuable landscapes have become subdivisions, shopping centers, and parking lots. The amount of nature contact for kids gets diminished when trees are lost to traffic. 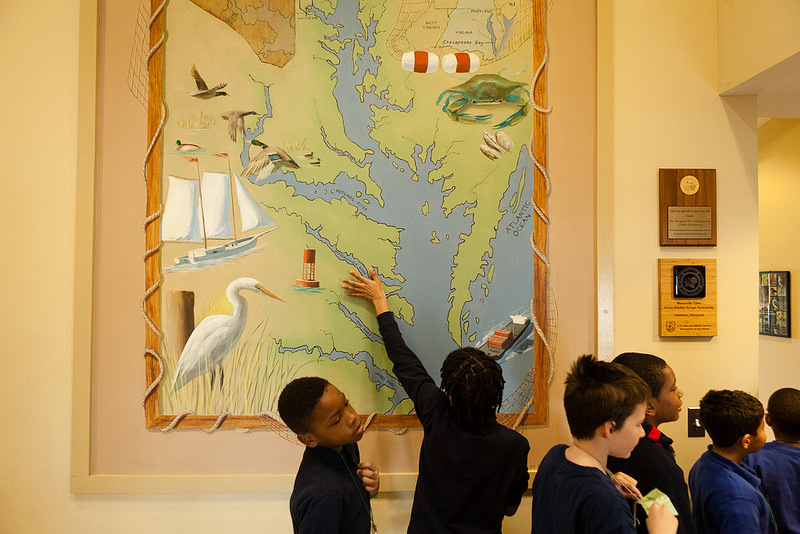 “Getting students outside and engaging them in immersive hands-on learning projects is the best way to inspire the next generation of scientists and environmental stewards,” states Congressman John Sarbanes. He has authored legislation toward an environmental education federal grant program. He concurs with research that describes how outdoor environmental learning is a mechanism to make kids healthier. It’s also an imperative if today’s youth are to understand the value of the earth as they live in urban areas. The Environmental Literacy Leadership Summit was coordinated by the National Oceanic and Atmospheric Administration (NOAA). 11,000 students across largely urban Melbourne, Sydney, Brisbane, and Perth will have an opportunity in 2016-2017 to see The National Theatre for Children (NTC) and its production of “The Treasure Trove of Conservation Cove: A Pirate’s Tale.” It’s an educational play about natural resource conservation. NTC is dedicated to delivering performances of all kinds that focus on wise energy use, science, technology, engineering and math (STEM), financial literacy, health and nutrition, and environmental literacy. The event is underwritten by Stockland, Australia’s largest diversified property group. Stockland was recognized by the S & P/ Dow Jones Sustainability Indices (DJSI) with a Gold Class Award for 2014-15, which recognizes companies that score within 1 per cent of the Global Real Estate Industry Group Leader. Stockland was also named one of the Global 100 Most Sustainable Corporations in the World at the World Economic Forum in Davos, Switzerland in 2014, for the fifth consecutive year. The best programs draw upon local knowledge, right? Well, the National Wildlife Federation (NWF) has decided that the most efficient way to educate children about environmental issues is to do so through students’ own communities. In August, 2016, NWF launched a global K-12 environmental literacy initiative. Its Eco-Schools programming will be offered to twenty thousand students abroad in Australia, Brazil, Norway, and Italy, and in the U.S. in Texas, North Carolina, and New York. Students will assess, design, and build innovative solutions to environmental challenges. NWF partners with the Alcoa Foundation, one of the largest corporate foundations in the U.S., for this initiative. In 2015, Alcoa Foundation contributed $22 million to nonprofit organizations. These programs have goals to improve the environment and educate tomorrow’s leaders for careers in manufacturing and engineering. The U.S. Environmental Protection Agency asserts that environmental education helps individuals to develop a deeper understanding of environmental issues and have the skills to make informed and responsible decisions. Yet, as reported by Ali Meyer in the Washington Free Beacon, the EPA can’t prove that the more than $16 million in grant funds it designated from 2012 to 2014 for environmental programs has improved environmental literacy and stewardship. EPA Inspector General Gina McCarthy issued those findings after an audit. It seems that confusion resulting from the Paperwork Reduction Act prevented the EPA from collecting data necessary to gauge results of its environmental education programs. These include evidence of results and benefits, ability to manage the program to achieve results, or spotting waste and abuse. What can we learn from recent environmental literacy initiatives? It’s interesting how both private industry and governmental agencies are getting on the green bandwagon. It would be nice to think that constituents want to be altruistic. That they want to help urban kids relate to the organic world. That explanation, however, seems a little too simple, a little too contrived. As far back as 1994, the Harvard Business Review outlined how philanthropy and business unite to “increase their name recognition among consumers, boost employee productivity, reduce R&D costs, overcome regulatory obstacles, and foster synergy among business units.” Yup, you’ve got it. Today’s public likes environmental activism, and that affection is being harnessed by companies that want a powerful competitive edge. Environmental philanthropy is strategic, and, as in the EPA data analysis, it may be more important to put on a nice face for the public than to have definitive results. As corporations attempt to search for ways to align their self-interest with the prevailing trends of society, environmental justice may come out as a winner.